Green rope from Calvert Island beaches; specimen collection numbers SCL 15281 (left) and SCL 15255 (right) in the UBC Herbarium Algae Database. Images courtesy of Sandra Lindstrom. Search the collection numbers in the database for further details on these specimens, or search this species for additional occurrences. The gametophyte form of this green alga is composed of hooked filamenous branches that entangle to form strands with the texture of frayed rope. The filaments of green rope are one cell wide; these cells are longer than they are wide, with branches projecting from them laterally. The thallus usually reaches up to 30 cm in length, though it can grow to 46 cm. Species of this genus hold water well, and can be wrung like a sponge to dry out the thallus. Green rope can be found in semi-exposed to protected locations, where it grows on rock in the mid- to low intertidal in spring and early summer. The above specimens Its range extends from northern Alaska to southern California. 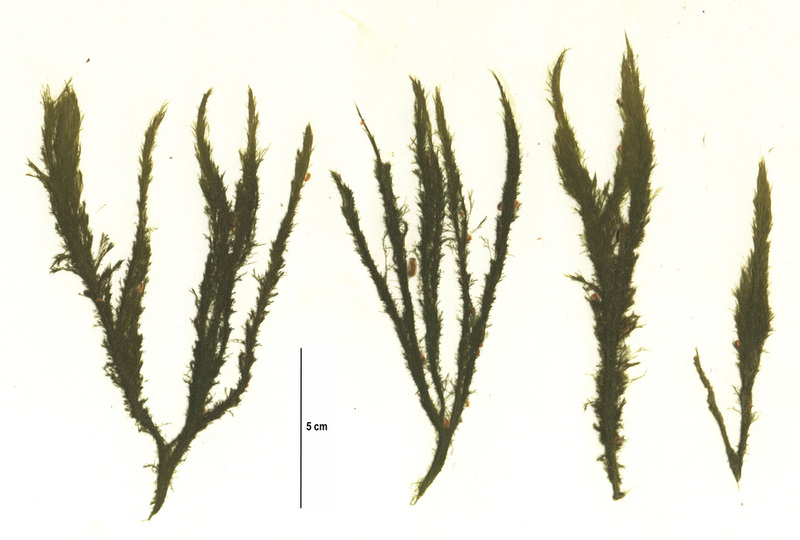 Arctic sea moss (Acrosiphonia arcta) and A. sonderi are also found on the Central Coast. 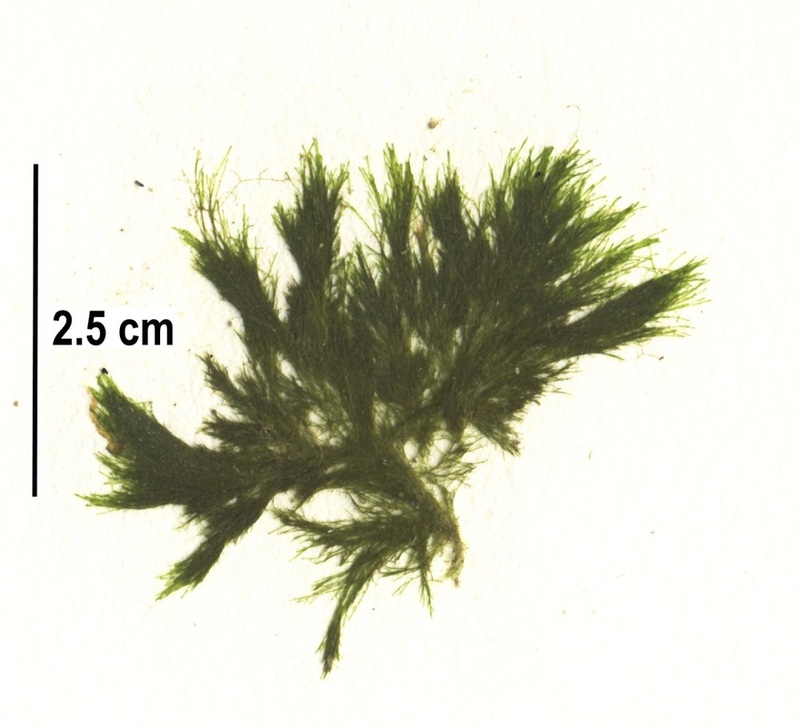 Arctic sea moss has a low, turfy form that help differentiate it from other species of its genus, and it lacks the rope-like strands of green rope. A. sonderi also has hooked filamentous branches that form rope-like strands, and its distribution in the Pacific Northwest is unclear as it has not been frequently documented in the region. The sporophyte is unicellular and lives in the tissues of some Mazzaella species. It was once thought to be a separate species and was named Codiolum petrocelidis. This single-celled stage is now called the ‘Chlorochytrium’ or ‘Codiolum’ phase. Lindberg, M. and Lindstrom, S. (2010). Acrosiphonia coalita Green Rope. Seaweeds of Alaska. Accessed 27/03/2015. Sussmann, A. V. and DeWreede, R. E. (2001). Life history of Acrosiphonia (Codiolales, Chlorophyta) in southwestern British Columbia, Canada. American Journal of Botany 88(9): 1535–1544. Kelly Fretwell, Sandra Lindstrom, and Brian Starzomski (2015).